My personal summary of the Better Buildings Conference in Burlington and a whole lot more. 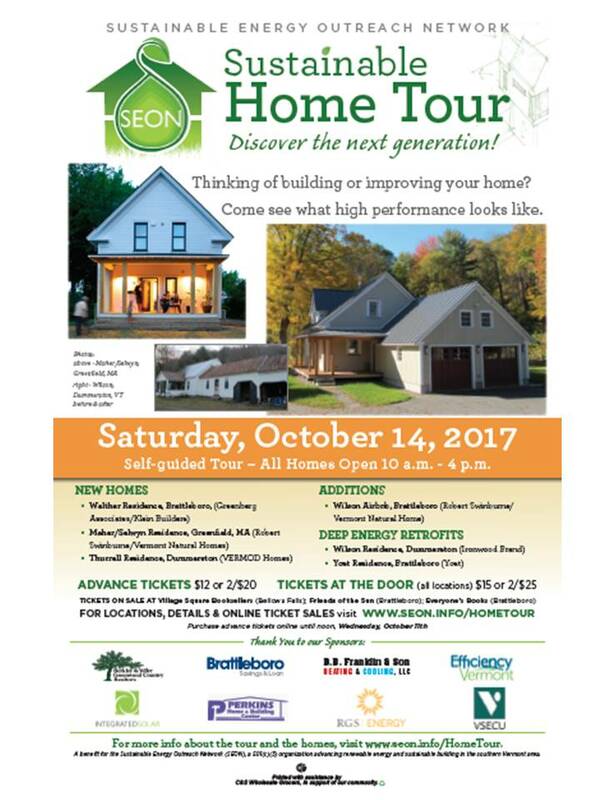 The folks over at 475 High Performance Building Supply wrote a very nice article about the Greenfield house last week. 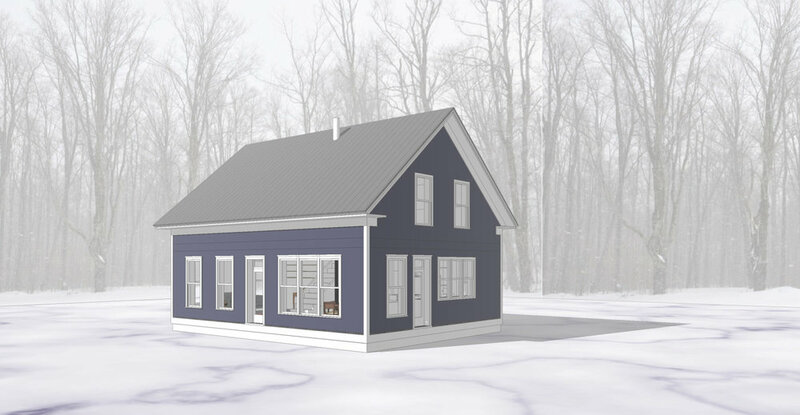 foursevenfive.com provides building materials and expertise to many high performance home builders and architects.This plan will be the next stock plan available in the VSH - Vermont Simple House series. I'm working on bringing it to a high level of detail now. State of…. Things.Nutshell: This has been a very busy spring and summer. I have barely been able to keep my head above water. I have two houses starting, one of which is for my wife’s folks so they can be closer to our family in their retirement. These still need lots of detailing and supervision and I’ll be doing some work on the In-law’s house. I have to write up a proposal for a slightly larger scale project than what I usually do which I would start toward the end of July. Another house that will be built in 2016 needs tons of work over the fall. There have been a few smaller jobs here and there and I should probably secure a few more house projects for next winter. I have a friend learning Vectorworks (my CAD program of choice) in order to be able to help me out a bit but I’ve found that my process throughout a job from initial site studies to final detailing doesn’t lend itself very well to hiring a drafter. I need to work on that. I don’t want to grow and take on employees at this point in my career. I can’t offer anybody x numbers of hours per week or a salary – I don’t really earn what any other architect would consider a living so how could I pay someone else? I need to do a better job of smoothing out the whole process and identifying potential collaboration aspects of what I do. I also had a recent small job where the clients really took advantage of my fee structure and contract with 10+ on site meeting to go over 30+ schemes that they had come up with (for me to make work). I would go home to draw something up and a new scheme would arrive in my inbox rendering the past afternoon’s work useless. I’ve never before had that happen on that extreme scale but I can see why other architects put clear limits on meetings and schematics. So the short of it is that I’m really busy doing fun work and actually starting to make some money at this. (I may be able to retire by 2045!) But I have a lot of work to do on crafting how I run my business, both for myself and for current and future clients. Entrepreneur Architect is an online community of small business owners in the field of architecture sharing information, ideas, and ways of doing business and generally supporting each other which has been immensely helpful over the years. the ALL -NEW Vermont Architect website and blog ! There have been some changes here spurred on by completely screwing up my blog last Friday when I hit "update" and everything disappeared. It wasn't really gone of course. But my backup copy made the day before wouldn't work. (I couldn't figure out how to make it work) Evidently, ignoring updates for too long was the underlying issue. I had been intending a complete makeover anyway, and I'm very pleased to have pulled it off. I used this template for those who are interested in that sort of thing. I am SO not a web developer but I know what I want and it seemed that I could accomplish it using this template with all its options and customization capabilities. I still have to figure out many small things that I want to adjust. Definitely view this on a big screen for maximum visual effect. It works on all screens but some of the pretty bits drop out when you start to squeeze it. There will be a ton of portfolio stuff and drawings and models added later (major eye candy) when I get the template right for that section. I also need a section to show off the press I get. (my intention for) The overall feel of the site a sense of transparency, light and peacefulness (introvertism?) and to express my connection to Vermont and the seasons here. The background photos are from my own land and are what I see every day. I also intend to set up a commerce section to make it simpler to sell my stock plans and perhaps even a section for clients to log in and download updates on their projects and see/pay invoices etc. I'll probably hire someone else to set that up. Passive House Training - One year later. Note: this blog entry was published on Green Building Advisor on March 31, 2014 I have been asked about my Passive House consultant training by other architects enough times that I though I'd write up a quick synopsis, one year later. For me, the Passive House training was very useful for several reasons, not the least of which was the networking aspect. It is a small community with some really great conversation happening and it is fun to be a part of that. There is a lot of controversy as well, especially on GreenBuildingAdvisor.com Such as where does the law of diminishing returns kick in when it comes to insulating and how to handle latent loads (excess moisture). Plus there's the whole U.S. vs the rest of the world thing which I won't go into as I find it rather annoying, or at least boring. Secondly, It represents state of the art science on how to build good buildings with an overriding emphasis on simplicity and quality. Passive House is really all about quality and even, as I'm finding out, represents a necessary re-thinking of how to get something built. A much more collaborative approach is necessary than often happens when building even high-end projects. The process gets much less linear. I also like the idea that the Passive House approach is a valid part of the conversation, not just achieving certification and getting the plaque to hang beside the front door. I see projects being showcased that utilized the approach in a value engineering manner to get the most bang for the buck that simply don't have the budget to go all the way and attain certification and I like the general consensus that that is okay. Much of my own work had been trending in the PH direction anyway so it was good to undergo the intensive training so that I could make decisions with much more confidence and authority that comes with PH credentials. As an architect who was never very (ahem) enthusiastic about the numbers and physics of things and more into the airy-fairy poetic nature and scholarly aspect of architecture it was also helpful in terms of training my weaknesses. I call myself a Passive House designer rather than a consultant in part because If I were to attempt a full-on certified Passive House, I would want to hire someone more experienced who does this on a daily basis to do the actual numbers part and look over their shoulder through the process - at least for the first few times. There is also the notion, similar to my approach to structural engineering where I try not to design anything too complicated to engineer myself - I prefer not to design anything that would require a complicated heating/ventilating system. It does get more complicated in renovation/addition work though for sure. My approach to structural engineering has always been very intuitive and very related to my own building experience and knowledge of materials, assemblies and connections My structural engineering professor once told me that the intuition part is vital and more than half the battle. First you intuit the solution then you apply numbers and formulas to check yourself. The Passive House training augmented my intuition and gave me more confidence to apply the numbers as well as a perspective on when, where and why. Plus it was really good for marketing. The Cotton Mill annual holiday sale and open studio is this weekend. I'll be around toting kids but not officially participating although I may be in the office some of the time. I printed up 1/2 doz. of these to pin up around the building. 4 bedrooms, 2.5 baths, super insulated, all on 70 acres with 2000' of Green River frontage on one edge of property and a brook with over 100' of cascading waterfalls in the middle, perfect for micro-hydro system. Heated it with 3.5 cords of wood and the sun. Old foundations on property. Nice sunrise view down the valley. I often need to spend minimal time - 10 to 20 hours at my hourly rate - to do a simple master planning/feasibility study to explore what can be done to an existing house and if it's worth it. 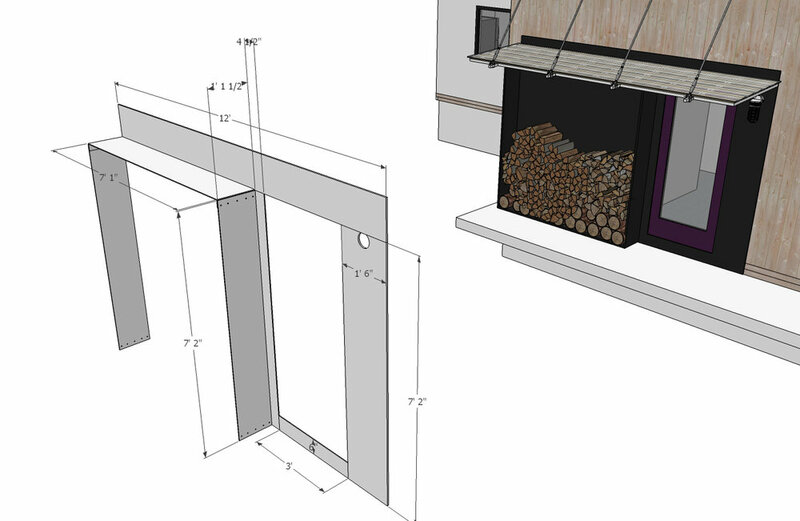 This process includes measuring existing conditions as much as is needed, photos, a thorough initial client meeting, thinking, sketching, some schematic design, modeling, more thinking, writing lists and generally trying to pare down the simplest solution to the client's goals. The result is a .pdf file which attempts to get all this down in a clear format which can be given to a builder for feedback and a VERY rough costing on the various parts and options. I have been assured by other architects that I am ridiculously fast at this in terms of total time spent. Projects often don't progress past this stage as clients realize that it would cost more to achieve what they want than they are able to spend. Or the project gets pared down at this early stage. It is a very useful exercise in saving money by spending some on the architect up front. It seems to be a good graphic way to quickly get a handle on the whole project without committing much in terms of $ from the client or time from me. Here are some examples of three recent projects. Here is an example of a basic one-page-wonder construction drawing for a simple house. Not all the information is here to build a house but an expert builder can fill in missing details. For example, I put the stairs in the section with a very basic level of detail to make sure they work and meet code, however, I did not detail anything further than that. The stairs could be built in a very modern way with cable railings or very old fashioned with spindle ballusters and a newell posts. I concentrated on the overall aesthetic, proper Greek Revival details for the location and good building science practices with a very detailed double stud wall section from foundation to roof. When I finally finished college (at age 25 and after 7 years) I didn't feel like I knew everything. In fact, I felt like I knew nothing. I still do actually. In reality, I have spent the last 19 years learning like crazy. After a year or so of internship, I went to work for Mindel and Morse Builders where I spent 5 years building houses, doing innumerable additions and renovations and generally learning like crazy. I learned a lot of practical stuff such as how to handle bituthene on a warm day but I also learned a lot about what I'm good at – and what I'm not good at. I'm not such a good finish carpenter - I don't have the patience. I can do it but it is “not me”. I am, however, a good framer. What I'm best at on the building end of things is understanding the flow, the dance of a project and I'm good at figuring out better ways of doing things. I'm good foreman material. But what I'm really best at is design, pure and simple. Since I decided to return my focus on the architecty side of things, I have continued to feel like I know nothing. Perhaps this is because my tendency to need to know something about everything, architecture and otherwise and the realization that no matter how much I know about a thing, there is always someone who knows more. Lately my interest (of the month) is energy modeling and Passive houses. I am currently evaluating whether to do Passive House Training which would result in me becoming a Passive House Consultant. I may never actually do a Passive House but the immersion in state of the art building science plus the practical aspect of learning the ins and outs of very powerful energy modeling software definitely has appeal. The cost of the program and spending 9 days away from home, perhaps not so much. The cost means I have to have some sense of return on investment which I have not come to terms with. Are there consulting opportunities? Is there a need? It would certainly help on my regular projects. Longer term I am really interested in doing the Master of Science in Historic Preservation program at UMass Amherst. Again, I have to look at cost and return on investment. New England architecural history is a fascinating subject to me and the idea of immersing myself in the subject rather than just occasionally reading a book or poking around in an old house has enourmous appeal and the program is very rich in hands-on learning. How would it affect my practice? Would it mean I would then be able to market a specialty in historic preservation? Many architects around here do that but without any real credentials. Or would it mean that I was very employable by a larger firm either as an employee or a consultant? Or would it mean little at all and really just be an intellectual detour? An M.S. in H.P. in combination with being a Passive House consultant would uniquely position me to deal with the “greening” of existing houses from all eras. A definite “growth industry” in the Northeast. I'm also signing up for an adult ed. class in welding – I have SO many super-cool furniture ideas involving steel. Of course, any insight from readers of my blog would be welcome.